First race of 2010!! Yippee!! Friday night I start to get ready for the race and thinking about the race plan... once again Laura's biggest goal for me was the negative split. My original goal of 7:20 pace (which I totally thought was a stretch goal) was abandoned when I finally sucked it up and asked Laura what I should shoot for... her answer... between 41 and 44 min... ummm okay... for those who don't have an instance pace calculator in their head 41 min is 6:35 pace and 44 is 7:06. My first thought was... wow, she really thinks I can do that? I'm easily persuaded because all of a sudden I was thinking... of course I can do that! I love the power of suggestion. So I quickly text my racing buddy Andrea... what do you think of going for 7:00 pace? she said, let's do it! ahh, yes, the watch, looking for some negative split action starts yelling at me to speed up... I can't you stupid watch, I'm using all my concentration to keep this left leg swinging forward! Crossed the line... 44:30... Kate was there to catch me (Kate I told you'd have to do that!!) and Andrea was right there to give me a hug and congrats, we were so psyched with our races, a PR for both of us! Ok... so here's the deal... I'll be the first to admit after the race I was thinking... wow, what could I have done if I didn't cramp, I was feeling so good... but when it comes down to it, for whatever reason (stress of the week, dehydration going into the race, etc.) I did cramp, and that's just what happened on the day... I dealt with it best I could and finished the race. So that's my race, no what if's floating around here... if I feel strongly enough that I have to prove to myself I could have finished faster, then I'll just have to find another 10k race. 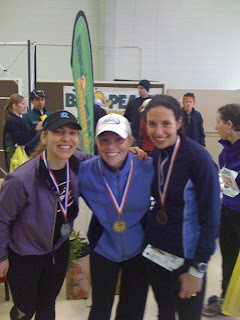 Turns out... Kate was 1st in her AG and Andrea and I were 3rd and 2nd respectively in ours!